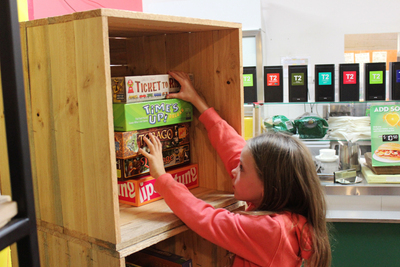 The Hungry Hippo is a great place to take older kids who are into board games of any kind. It's not specifically designed for kids, but they're very welcome. 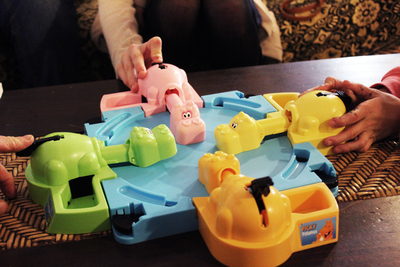 With anything from Hungry Hungry Hippos to Settlers of Catan, you can easily have a few hours of fun. The cafe is only open three days a week, and only at night. During the day it's actually a different cafe with a different menu and no board games. 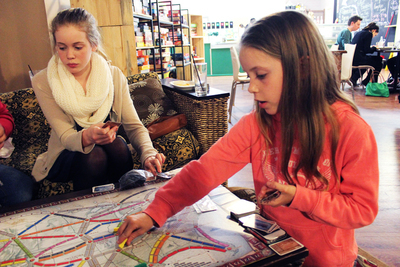 We recommend coming with older kids who already have a grasp on some of the simpler board games. 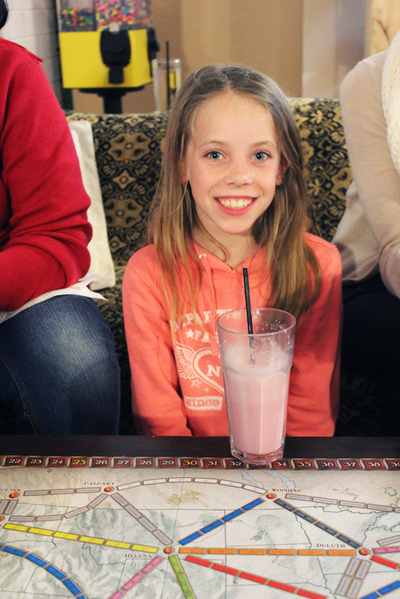 There's not a huge kids' menu and younger kids might get a little bit board and rowdy if they don't understand the games that everyone else is enjoying. It's $5 per person to play games--you pay when you order your food or drinks. 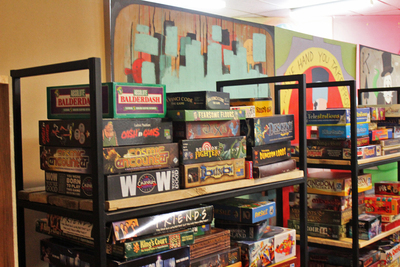 Then you can choose from the huge selection of board games available. You don't have to stick to one game. For the $5 you can play multiple games; just make sure you're not taking up a table when there's someone else waiting to play. We played ticket to ride with the 8-year-old and the 13-year-old. They'd already played the iPad version, so they were familiar with the rules, but the board game was a bit expensive to purchase. We had a fun night playing it at The Hungry Hippo instead. 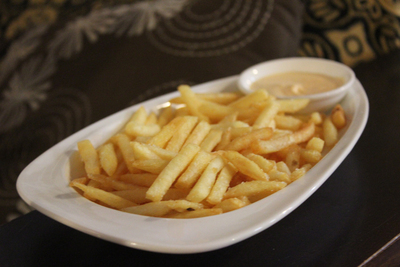 The food isn't incredibly kid-friendly if you have fussy eaters, but they do have failsafe fries on the menu. The meals are light, and they're all vegetarian. There are nachos, burgers, wedges, dips, and soup. Drinks are also available. 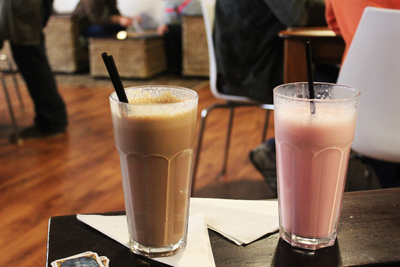 The milkshakes are delicious; as well as your regular flavours like chocolate, strawberry and vanilla they have tasty options like choc peanut butter and not nutella (hazelnut spread flavoured). 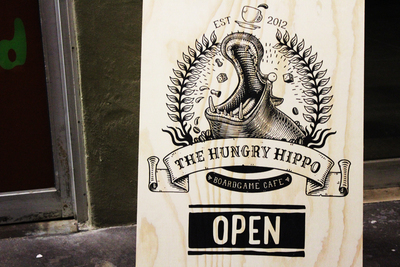 The Hungry Hippo Board Game Cafe is a great example of a place that's not aimed at kids but that still manages to be a great family place. For more info check out the Hungry Hippo Facebook page, or head to their website to check out a list of the games available. What are your favourite board games to play? Are family game nights fun, or do they usually end in disaster? What are your favourite non-carbonated drinks?